Father's Day turned out to be a lovely day. We had both grandpas here for a BBQ which is actually called a "Grill Out" if you live in my neck of the woods. Or worse yet-a "Fry." As in, "Would you like me to bring over some brats for da Fry?" You need to be a real lifer around these parts to utter that phrase. It drives me insane...it's not a "fry." We're not "frying" anything. There are no frying pans lying about. No one is eating a fried egg or fried fish or chicken fried steak that I'm aware of. There is a fire with a grill grate and there is meat on it. We're grilling it. On a grill. But anyway...I digress (who? me? never!). Like I said, we had both our dads here for a little get together. 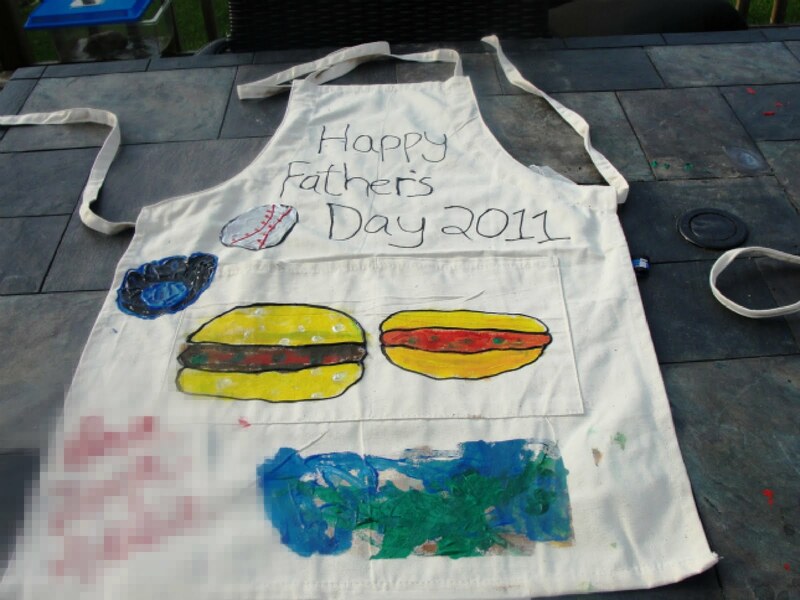 The kids made their grandpas some custom made grilling aprons to go with their new grilling (not frying) utensils. They were a big hit and turned out to be very nice. I got the ideas for both the aprons and the cupcakes over at the Family Fun website. ﻿Miss A loved this little project. We got an apron from the craft store along with some fabric paints and we were off! It worked well to tape of a section with masking tape for the 3 year old so she wouldn't ruin her older brother's hard work. My boy took this very seriously as he does with everything he attempts. It was his idea to paint a hamburger, a hot dog, a baseball and a glove. Cute! Lawn Mower Cupcakes! We used Skittles instead of M & M's as My Boy has a peanut allergy and red licorice instead of black (black licorice is from the devil-blech!). These were actually really easy and fun to make. Trust me, if I'm saying that it's really true. So, our day﻿ was grand. I think all the dads felt very appreciated. I hope my husband did. He seriously is such a great dad-one of those guys that slipped so seamlessly into the role that you would never know that he had once been a self-centered twenty-something that had never looked directly at, let alone held, a baby before. His progression into this amazing, hands on, nurturing, caring father has astounded me. I am proud to be the mother of his children. Amen. Sorry Jenny - I have to disagree aboout red licorice. It's like white chocolate ... no such thing! I do like the cupcakes. Adorable. I think you can outdo Martha any day.